Big Ben might be themed around the famous London landmark, but it’s also about London in general and most of the design will reflect that. It’s the best paying slot machine that Aristocrat offers right now, so naturally it will get plenty of attention from players. The travel themed games that are released these days tend to look pretty great, offering images of things that people all over the world dream of seeing. Big Ben seems to do a decent job at showing off some of the iconic British images that everyone recognizes. 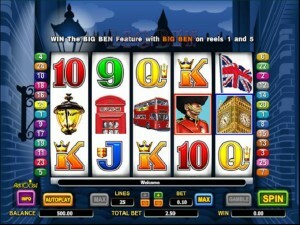 5 reels with 25 lines are used in Big Ben, a game which has a layout which Aristocratic seems to be fond of. The list of features includes the free games, their multipliers, the wilds and scatters. The game’s biggest payout is worth $60,000, which is one of the most impressive from the slots of this developer. As features, you will find wilds which multiply prizes, scatters which trigger free spins, plus multipliers that are offered for those rounds. The most useful and the best paying symbol of Big Ben is the one with the Guard on it. It’s the typical image of the guard dressed in red, with a huge hat, which is known for staying still for hours in front of the Queen’s palace. This is the wild symbol and it has a 2x multiplier which is applied whenever it contributes to the formation of a new combo. The same wild offers prizes of 10x to 30,000x, though you need up to five of them on the same line for that to happen. The other major symbol of Big Ben is almost as impressive as the wild. That’s because it both offers prizes of up to 1,000x the bet and it triggers free spins with multipliers. That 1,000x prize is bigger than anything you can expect in other slot machines, where 100x-200x prizes are considered normal when coming from scatters. 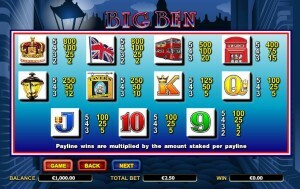 Another way of getting a prize is by landing the Big Ben symbol on the 1st and 5th reels at the same time. 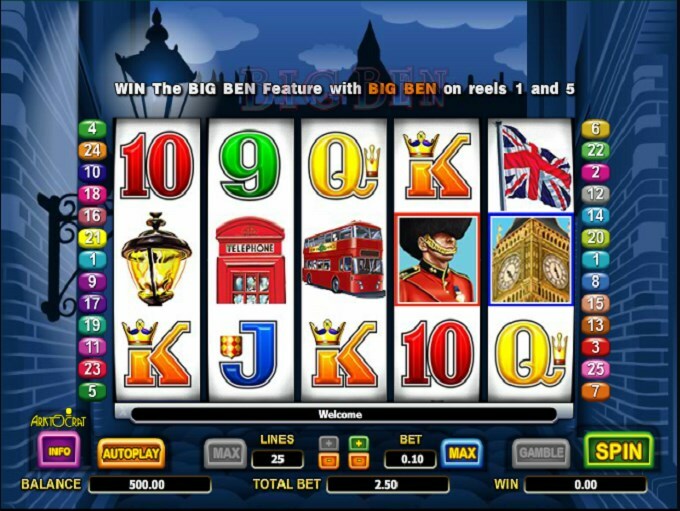 The slot has free spins and the exact number of rounds you get will depend on the number of triggering Big Ben scatters. Three of these symbols will give you 15 free spins, four will trigger 20 and the maximum of 25 spins can be won with five scatters. Prizes won during the free spins are all doubled, a multiplier being applied to all of them. Since the wild also has a multiplier, if it makes an appearance during the free spins you will get four times the regular prize from that combo. 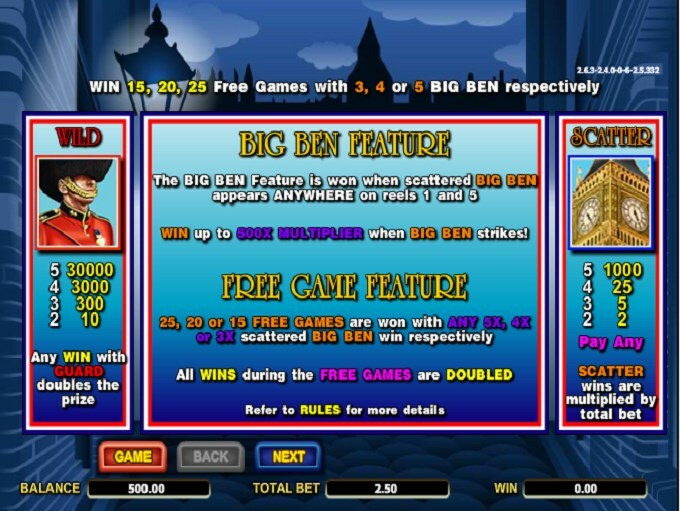 Re-triggering the free spins is possible, but you need another 3+ scattered Big Ben icons. Whenever Big Ben is on the 1st and the 5th reels during the same spin, the Big Ben bell will chime. A random number of chimes will be heard, between 1 and 12. The prizes offered will vary between 2x and 500x. You can use only one coin on each line you want active, so you wager 1 to 25, depending on the kind of chances you want, to get a win each round. Each coin is worth between $0.01 and $2, so you can expect top wagers of $50. The game is going to award payouts of up to 30,000 coins, which is impressive for any game, considering that the most generous ones tend to stop at 15,000x. You can get up to $60,000 this way, with $2 coin denominations used. The game relies on a lot of symbols with a British influence, things you expect to see when you visit London. From the Crown jewels, to the Queen’s guards, red telephone booths or landmarks like Big Ben, they’re all present among the symbols and it’s a pleasure to see them form combinations. The downside is the presence of the classic playing card icons, used in this exact form in a lot of slot machines. The streets of London are visible behind the reels, though in cartoon form and shown at night. Symbols: Queen’s Guard (30,000 coins, wild), Big Ben (scatter, 1,000x the bet), Queen’s Crown (800 coins), Great Britain Flag (800 coins), Double Decker Bus (500 coins), Telephone Booth (400 coins), Street Light (250 coins), Tavern Sign (250 coins), King (125 coins), Queen (100 coins), Jack (100 coins), 10 (100 coins) & 9 (100 coins). The connection with England and some of its most memorable sights will make travelers all over the world instant fans of this game, but even more people will appreciate that 30,000x top jackpot that it offers. 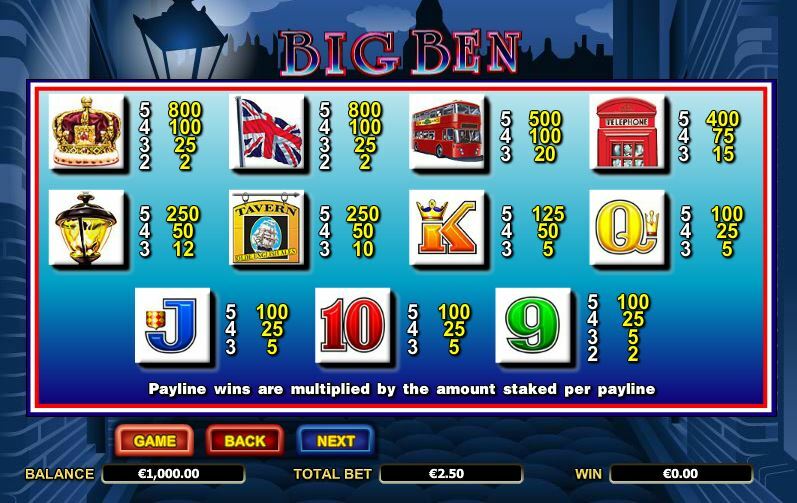 The Big Ben slot machine is offered through the Aristocrat platform, so if you want to play it for real or just to practice, look out for casinos that use it.